Wow, this book sounds gorgeous! I don't read much historical fiction, but more and more I am a fan of a well-done historical fantasy, and this one seems to have all the right elements of history, magic, fantasy, danger, and romance. Can we get a sa-wooon here? 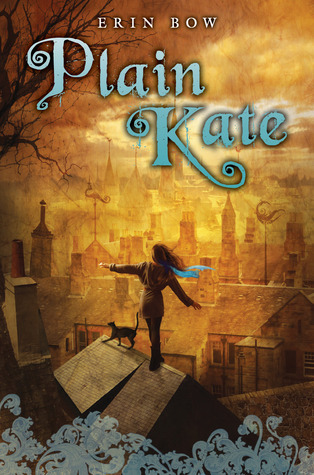 Plain Kate will be released in hardcover by Arthur A. Levine Books on September 1, 2010. Trust me, it is every bit as wonderful as it sounds. That book sounds awesome and I just added it to my list of books to watch. Here's mine. This sounds like a fantastic book. I will definitely have to read this. Great pick! This one sound amazing and I love that cover! Looks so adventurous! I've followed her husband's blog for years and he's a published author as well. I loved his Unwritten Girl Trilogy. Heard great things about this one and I'm looking forward to it as well! I've been wanting to read this one too! Oh I love a good historical fiction fantasy! Sounds good! Plain Kate sounds terrific, I hope the content is as good as the description makes it out to be. Ok, now I read R.J. Anderson's comment and I'm sold(loved Knife so I'm trusting her judgement!). By the way I just saw they are going to have a signing for Plain Kate at BEA for anyone attending.